The Next Stage: Women and Retirement: Why is Elena Ferrante writing a column for The Guardian? Why is Elena Ferrante writing a column for The Guardian? Why is Elena Ferrante writing a column for The Guardian? “Elena Ferrante” is, of course, a pseudonym or as she is sometimes called, “a fictional character,” camouflage for the author (or authors) of the novels attributed to Ferrante. If these personal columns by “a fictional character” were powerfully written, I could see a justification for their existence, but this is generally not case. Some of the reflections are similar to those of Ferrante’s characters, but these jottings are not embedded in a compelling story; instead they stand by themselves. They are often written in a pedestrian style, very different from the emotionally charged prose of Ferrante’s novels. The first time I got pregnant, it was difficult to accept. Pregnancy was an anxious mental struggle. I felt it as the breakdown of an equilibrium already precarious in itself, as a revelation of the animal nature behind the fragile mask of the human. For nine months I was on a seesaw of joy and horror. The birth was terrible, it was wonderful. Taking care of a newborn, by myself, without help, without money, exhausted me; I hardly slept. I wanted to write and there was never time. Or if there was some, I would concentrate for a few minutes and then fall asleep fretfully. Until slowly everything began to seem to me marvellous. Today I think that nothing is comparable to the joy, the pleasure, of bringing another living creature into the world. For Elena, problems began after her relatively easy first pregnancy. “ I had atrocious labor pains, but they didn’t last long. When the baby emerged and I saw her black-haired, a violet organism that, full of energy writhed and wailed, I felt a physical pleasure so piercing that I still know no other pleasure that compares to it. [But soon after] the state of well-being ended suddenly…the baby became troublesome (TWL, 237-38). "the most intense pleasure of my life…But then came [her second daughter] Marta. She attacked my body, forcing it to turn on itself, out of control. She immediately manifested herself, not as Marta but as a piece of living iron in my stomach. My body became a bloody liquid; suspended in it was a mushy sediment in which grew a violent polyp so far from anything human that it reduced me, even though it fed and grew, to a rotting matter without life” (LD, 110). "Your own body [is] angry with you and in fact rebels against you until it achieves the most terrible pain imaginable. For hours [Lila] had felt in her belly sharp cold flames, an unbearable flow of pain that hit her brutally in the pit of her stomach and then returned, penetrating her kidneys” (SLC, 216). Not only are ideas about motherhood in Ferrante’s novels more complicated than those in the Guardian column, but the emotionally charged prose of the novels is very different from that of the columns. I cannot help but wonder if the person who wrote the columns is the same person (or persons) who wrote the novels. 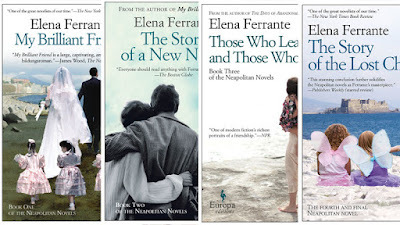 The only justification I can think of for publicizing the reflections of the fictional character Ferrante is that her publishers want to make sure they keep Ferrante Fever burning in anticipation of the upcoming HBO series based on Ferrante’s novels. There are signs that Ferrante Fever may be waning and the columns may be an attempt to counter that, but I question whether many readers of these columns will be motivated to read Ferrante's extraordinary novels.